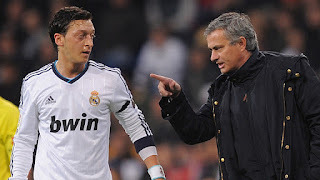 Prior to his switch to Arsenal, we were made to understand that Mesut Ozil was involved in a bust-up with Jose Mourinho. In his new autobiography, the German international has revealed that the Portuguese called him 'a coward' during his days at Real Madrid. The book Die Magie des Spiels (The Magic of the Game) is being published in series on German newspaper Bild and it gave details of a heated row between the duo after an unspecified game. "You think two beautiful passes are enough," said Mourinho, as written by Ozil. "You think you're so good that 50 per cent is enough." Ozil added: "He pauses. Stares at me with his dark brown eyes. I stare back. Like two boxers at the stare-down before the first round. He shows no emotion. Just waits for a response from me. How much I hate him right now. And I love Mourinho actually." The Manchester United boss continued with the slamming as Ozil threw his shirt on the floor: "Oh, are you giving up now? You're such a coward. "What do you want? To creep under the beautiful, warm shower? Shampoo your hair? To be alone? Or do you want to prove to your fellow players, the fans out there, and me, what you can do."